Taken from Berroco Pattern Books - 325 -Lacey & Ric Rac: "A deep v-neck, basic cardigan with three-quarter length sleeves and ribbed edgings. " 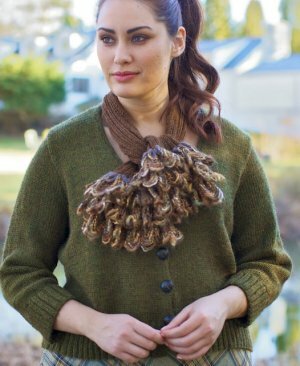 This pattern is in Berroco Pattern Books - 325-Lacey & Ric Rac, page 13. Size US 6 (4.0 mm) straight, US 8 (5.0 mm) straight or size to obtain gauge, US 8 - 29" circular. Gauge: 20 sts and 26 rows over 4" in st st.
Color Shown is #62173 Forest Mix in Ultra Alpaca. From $54.40 to $58.00 -- Kit price including yarn only (no book or pattern). From $67.40 to $71.00 -- Kit price including yarn only (no book or pattern). From $80.40 to $84.00 -- Kit price including yarn only (no book or pattern). From $93.40 to $97.00 -- Kit price including yarn only (no book or pattern). From $106.40 to $110.00 -- Kit price including yarn only (no book or pattern).